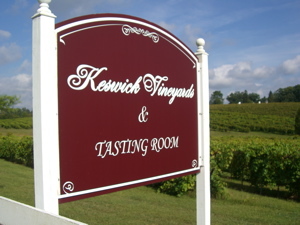 The next stop on the Monticello Wine Trail included a visit to Keswick Vineyards. Located at the historic 400-acre Edgewood Estate in Keswick, Virginia, the winery was recently awarded the 2009 Virginia Governor’s Cup for their 2007 Cabernet Sauvignon (see my earlier post on the Governor’s Cup). Keswick offers two tastings, a regular ($5) and select ($8 and includes the glass). I opted for the select tasting which included 7 wines, three whites and four reds. The whites were solid, with my top scores going to the Chardonnay and the Les Vents d’Anges, both from the 2008 vintage. A textbook Chardonnay retailing for $18.95, was fermented and aged in a combination of French and American Oak. The Les Vents d’Anges ($17.95 retail) is a stainless steel Viognier that was simply delicious. Beautiful citrus on the nose, followed by good acidity on the palate. As advertised, the reds were impressive and scored highest on my tasting sheet. I enjoyed all four, with the 2007 Cabernet Sauvignon and 2008 Touriga taking the top spots. A fruit bomb, the Touriga retails for $19.95 and is blended with Chambourcin, a hybrid grape that is doing very well in Virginia. Last, but certainly not least, is the Governor’s Cup winner. Although not worth the price tag of $59.95, the Cab is a solid effort that shows the potential of the variety in Virginia. I’m excited to visit Keswick in the future and recommend my readers do so as well. 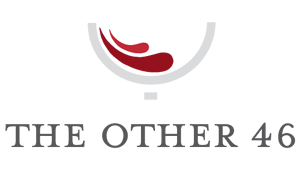 Pack a picnic or enjoy a cheese ball with a bottle of their award-winning wines. Cheers!